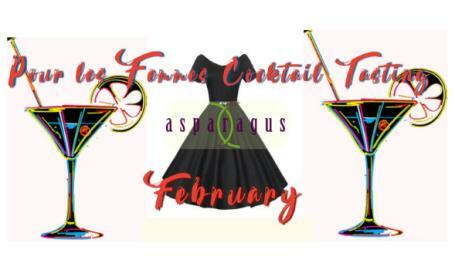 Pour les Femmes February Cocktail Tasting! Asparagus is planning to serve old and new favorites that customers have voted as being some of their all-time favorites; including a Godiva chocolate feature, a flavorful fruit-based concoction, a sparkling drink, and more. Chief mixologist Chef Tammy will be conjuring up the perfect foursome of taster drinks for your pleasure. Only $25 per person for four taster cocktails. Advance reservation with credit card required. Seatings start at 6:30, first pour at 7:00 pm Call 219-794-0000.